LOS ANGELES, CA – December 1, 2016 – Capcom, a leading worldwide developer and publisher of video games today released its highly popular courtroom drama, Apollo Justice™: Ace Attorney™to for iPhone and iPad devices. In this fourth game in the series, players star as rookie defense attorney Apollo Justice as he visits crime scenes, questions key witnesses and collects vital evidence before stepping into the courtroom to prove his clients’ innocence. Facing Apollo across the courtroom is the highly talented and flamboyant prosecutor Klavier Gavin who, in addition to being a legal genius, is also lead singer of the Gavinners, a highly successful rock band with a string of hits to their name. For the smartphone and tablet version of the game, Capcom has optimized the UI and graphics to take advantage of the superior resolutions and aspect ratios available with these current devices. 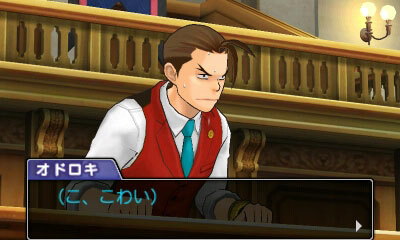 Additionally, the smartphone game will offer full English and Japanese language support. For more information, please visit our press page at www.press.capcom.com . Capcom Mobile is a wholly owed subsidiary of Capcom Co., Ltd. Our company is dedicated to bringing the amazing characters, stories and experiences of Capcom to the a new generation of mobile players everywhere. With one eye on the latest technology and another on Capcom¹s proud legacy we¹re looking to forge the next chapter in Capcom¹s amazing history. Capcom Mobile maintains operations in Los Angeles, Toronto, Tokyo, and Osaka, Japan. Capcom was founded in 1983, and is responsible for some of the most celebrated franchises in gaming including Resident Evil®, Street Fighter®, Monster Hunter®, Ace Attorney®, Mega Man® and Devil May Cry®.